When you decide to start a business, one of the most important decisions you’ll need to make is choosing the right business entity. It’s a decision that impacts many things–from the amount of taxes you pay to how much paperwork you have to deal with and what type of personal liability you face. There are two types of partnerships: Ordinary partnerships, called “general partnerships,” and limited partnerships that limit liability for some partners but not others. Both general and limited partnerships are treated as pass-through entities under federal tax law, but there are some relatively minor differences in tax treatment between general and limited partners. For example, general partners must pay self-employment tax on their net earnings from self-employment assigned to them from the partnership. Net earnings from self-employment include an individual’s share, distributed or not, of income or loss from any trade or business carried on by a partnership. Limited partners are subject to self-employment tax only on guaranteed payments, such as professional fees for services rendered. A Limited Liability Company (LLC) is a business structure allowed by state statute. Each state is different, so it’s important to check the regulations in the state you plan to do business in. Owners of an LLC are called members, which may include individuals, corporations, other LLCs and foreign entities. Most states also permit “single member” LLCs, i.e. those having only one owner. Depending on elections made by the LLC and the number of members, the IRS treats an LLC as either a corporation, partnership, or as part of the LLC’s owner’s tax return. A domestic LLC with at least two members is classified as a partnership for federal income tax purposes unless it elects to be treated as a corporation. In forming a corporation, prospective shareholders exchange money, property, or both, for the corporation’s capital stock. A corporation conducts business, realizes net income or loss, pays taxes and distributes profits to shareholders. When making a decision about which type of business entity to choose each business owner must decide which one best meets his or her needs. One form of business entity is not necessarily better than any other and obtaining the advice of a tax professional is critical. If you need assistance figuring out which business entity is best for your business, don’t hesitate to call. Numerous reports of scammers sending fraudulent CP2000 Notices for tax-year 2015 have been received by the IRS, resulting in an investigation by the Treasury Inspector General for Tax Administration. The notice relates to the Affordable Care Act (ACA) and requests information regarding 2014 coverage. It also includes a request for payment of unpaid taxes. A CP2000 Notice is generated by the IRS Automated Underreporter Program when income reported from third-party sources (such as an employer) does not match the income reported on the tax return. It provides extensive instructions to taxpayers about what to do if they agree or disagree that additional tax is owed. Commonly mailed to taxpayers through the United States Postal Service, a CP2000 Notice is never sent as part of an email to taxpayers. Taxpayers and tax professionals should be on guard against fake emails purporting to contain an IRS tax bill related to the Affordable Care Act. Generally, the scam involves an email that includes the fake CP2000 notice as an attachment. The fraudulent CP2000 Notice includes a payment request that taxpayers mail a check made out to “I.R.S.” and sent to the “Austin Processing Center” at a Post Office Box address. This is in addition to a “payment” link within the email itself. In addition, if taxpayers are unable to pay, it provides instructions for payment options such as installment payments. To determine if a CP2000 Notice that you received in the mail is real, go to the IRS website and use the search term, “Understanding Your CP2000 Notice.” You will see an image of a real notice. Individuals with questions about a notice or letter they receive from the IRS can generally do a keyword search for “Understanding Your IRS Notice or Letter” on the IRS.gov website and view explanations and images of common correspondence. Don’t hesitate to contact the office if you have any questions about IRS notices or letters you have received in the mail or otherwise. Cash flow is the lifeblood of any small business. Some business experts even say that a healthy cash flow is more important than your business’s ability to deliver its goods and services. While that might seem counterintuitive, consider this: if you fail to satisfy a customer and lose that customer’s business, you can always work harder to please the next customer. If you fail to have enough cash to pay your suppliers, creditors, or employees, you are out of business! If you need help analyzing and managing your cash flow more effectively, please call the office. Got kids? They may have an impact on your tax situation. If you have children, here are eight tax credits and deductions that can help lower your tax burden. Dependents: In most cases, a child can be claimed as a dependent in the year they were born. Be sure to let the office know if your family size has increased this year. You may be able to claim the child as a dependent this year. When you make an interest-free loan to someone, you will be subject to “below-market interest rules.” IRS rules state that you need to calculate imaginary interest payments from the borrower. These imaginary interest payments are then payable to you, and you will need to pay taxes on these interest payments when you file a tax return. To complicate matters further, if the imaginary interest payments exceed $14,000 for the year, there may be adverse gift and estate tax consequences. As was mentioned above, if you don’t charge any interest, or charge interest that is below market rate (more on this below), then the IRS might consider your loan a gift, especially if there is no formal documentation (i.e. written agreement with payment schedule), and you go to make a nonbusiness bad debt deduction if the borrower defaults on the loan–or the IRS decides to audit you and decides your loan is really a gift. AFRs for term loans that is, loans with a defined repayment schedule, are updated monthly by the IRS and published in the IRS Bulletin. AFRs are based on the bond market, which changes frequently. For term loans, use the AFR published in the same month that you make the loan. The AFR is a fixed rate for the duration of the loan. If you have any questions about the tax implications of loaning a friend or family member money, don’t hesitate to call. 1. Business Structure. One of the first decisions you need to make is which type of business structure to choose. The most common types are sole proprietor, partnership, and corporation. This is an important step because the type of business you choose will determine which tax forms you file. See, Choosing the Right Business Entity, above. 2. Business Taxes. There are four general types of business taxes. They are income tax, self-employment tax, employment tax, and excise tax. In most cases, the types of tax your business pays depends on the type of business structure you set up. You may need to make estimated tax payments. If you do, you can use IRS Direct Pay to make them. It’s the fast, easy and secure way to pay from your checking or savings account. 3. Employer Identification Number (EIN). You may need to get an EIN for federal tax purposes. The easiest way to find out if you need an EIN is to use the search term “do you need an EIN” on the IRS.gov website. If you do need one, contact the office or apply for one online at IRS.gov. 4. Accounting Method. An accounting method is a set of rules that you use to determine when to report income and expenses. The two that are most common are the cash and accrual methods, and you must use a consistent method. Under the cash method, you normally report income and deduct expenses in the year that you receive or pay them. Under the accrual method, you generally report income and deduct expenses in the year that you earn or incur them. This is true even if you get the income or pay the expense in a later year. 5. Employee Health Care. The Small Business Health Care Tax Credit helps small businesses and tax-exempt organizations pay for health care coverage they offer their employees. You’re eligible for the credit if you have fewer than 25 employees who work full-time, or a combination of full-time and part-time. The maximum credit is 50 percent of premiums paid for small business employers and 35 percent of premiums paid for small tax-exempt employers, such as charities. Don’t hesitate to call the office if you need answers! Every business owner, no matter how small, must keep good records. But whether it’s keeping track of mileage, documenting expenses, or separating personal from business use, keeping up with paperwork is a seemingly never ending job. No matter how good your intentions are in January, the chances are good that by summer that mileage log is looking a bit empty. Even worse, you could be avoiding tracking your mileage altogether–and missing out on tax deductions and credits that could save your business money at tax time. The good news is that there are a number of phone applications (apps) that could help you track those pesky business miles. Most of these apps are useful for tracking and reporting expenses, mileage and billable time. They use GPS to track mileage, allow you to track receipts, choose the mileage type (Business, Charitable, Medical, Moving, Personal), and produce formatted reports (IRS compliant HTML and CSV tax return reports) that are easy to generate and share with your CPA, EA, or tax advisor. Call the office today if you have any questions about using apps that track business mileage or need help choosing the right one for your business needs. Miscellaneous deductions such as certain work-related expenses you paid for as an employee can reduce your tax bill, but you must itemize deductions when you file to claim these costs. Many taxpayers claim the standard deduction, but you might pay less tax if you itemize. Work clothes and uniforms required for your job, but not suitable for everyday use. Need more information about itemizing deductions or help setting up a system to track your itemized deductions? Help is just a phone call away. Millions of people enjoy hobbies such as stamp or coin collecting, craft making, and horse breeding, but the IRS may also consider them a source of income. As such, if you engage in a hobby that provides a source of income, you must report that income on your tax return; however, taxpayers (especially business owners) should be aware that the way income from hobbies is reported is different from how you report income from a business. For example, there are special rules and limits for deductions you can claim for a hobby. Business versus Hobby. There are nine factors to consider to determine if you are conducting business or participating in a hobby. Make sure to base your decision on all the facts and circumstances of your situation. To learn more about these nine factors, please call. Allowable Hobby Deductions. You may be able to deduct ordinary and necessary hobby expenses. An ordinary expense is one that is common and accepted for the activity. A necessary expense is one that is helpful or appropriate. Don’t hesitate to call if you need more information about these rules. Limits on Expenses. As a general rule, you can only deduct your hobby expenses up to the amount of your hobby income. If your expenses are more than your income, you have a loss from the activity. You can’t deduct that loss from your other income. How to Deduct Expenses. You must itemize deductions on your tax return in order to deduct hobby expenses. Your costs may fall into three types of expenses. Special rules apply to each type. Use Schedule A, Itemized Deductions to report these types of expenses. Use a tax professional. Hobby rules can be complex, but using a tax professional makes filing your tax return easier. If you need have any questions about reporting income from a hobby, please call. Whether you play the lottery, roll the dice, play cards, or bet on the ponies, all of your gambling winnings are taxable and must be reported on your tax return. If you gamble, these tax tips can help you at tax time next year: Here’s what you need to know about figuring gambling income and loss. 2. Payer tax form. If you win, you may receive a Form W-2G, Certain Gambling Winnings, from the payer. The form reports the amount of your winnings to you and the IRS. The payer issues the form depending on the type of game you played, the amount of winnings, and other factors. You’ll also receive a Form W-2G if the payer withholds federal income tax from your winnings. 3. How to report winnings. You must report all your gambling winnings as income on your federal income tax return. This is true even if you do not receive a Form W-2G. If you’re a casual gambler, report your winnings on the “Other Income” line of your Form 1040, U. S. Individual Income Tax Return. 4. How to deduct losses. You may deduct your gambling losses on Schedule A, Itemized Deductions. The deduction is limited to the amount of your winnings. You must report your winnings as income and claim your allowable losses separately. You cannot reduce your winnings by your losses and report the difference. 5. Keep gambling receipts. You must keep accurate records of your gambling activity. This includes items such as receipts, tickets or statements. You should also keep a diary or log of your gambling activity. Your records should show your winnings separately from your losses. If you have questions about gambling income and losses, don’t hesitate to call. Are you considering processing your own payroll in QuickBooks? Whether you’re moving from a payroll service or getting ready to pay your first employee, you’re taking on a complex set of tasks that requires a great deal of setup and absolute precision. But the reward is complete control over your compensation records and transactions, and constant access to your payroll data. If you have no experience dealing with paychecks, deductions, and payroll taxes, we strongly recommend that you call the office before you get started. While QuickBooks simplifies the actual mechanics of setting up and running payroll, there’s still a lot you need to know. It goes without saying that accuracy is critical here. You’re responsible for your employees’ livelihoods and for maintaining any benefits they receive. Federal, state and local taxing agencies will count on you to submit the proper payroll taxes and filings on time; failure to do so can result in stiff penalties and worse. That said, here is a brief preview of how QuickBooks Payroll Items work. First, make sure that payroll is turned on. 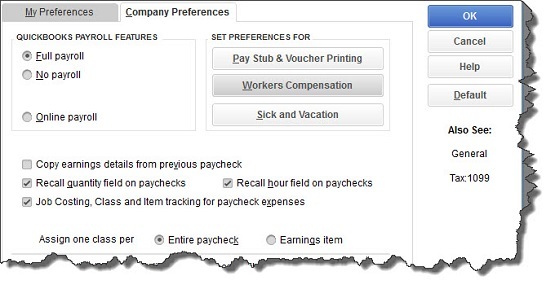 Next, open the Edit menu and click Preferences, then click Payroll & Employees | Company Preferences. Under QUICKBOOKS PAYROLL FEATURES, make sure the button in front of Full Payroll is filled in by clicking on it. If you’re interested in exploring Intuit’s online payroll service, someone can tell you about that, as well as advise you on the other options displayed here. This element of your accounting is complicated enough that QuickBooks has a separate setup tool to guide you through the myriad details you’ll need to provide. You find this tool by going to Employees | Payroll Setup. This is a multi-screen, wizard-like tool that walks you through the process of providing information about employees, compensation, benefits and other additions/deductions, and taxes. Each page poses questions, and you provide answers by entering data and selecting options from drop-down lists. In doing so, you’re creating Payroll Items. This is a time- and labor-intensive process, one that will send you scrambling for all of the minutiae that make up your payroll system. Once you have your payroll framework established, though, as we said earlier, everything will be in one place and easily accessible. The information you entered in Payroll Setup is likely to change and need modification. Maybe you forgot to account for something while you were working in the wizard, or perhaps you just want to look up a bit of payroll data. To do any of these, open the Listsmenu and click on Payroll Item List. 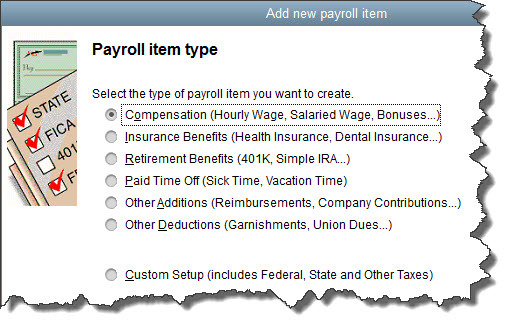 Figure 2: You can access this menu from the bottom of the Payroll Item List screen. The window that opens contains a list of the Payroll Items you created. It looks like a checkbook register, with one line devoted to each item. You’ll be able to view, for example, its Type, any Limit imposed, the Payable To name, and Tax Tracking designations. 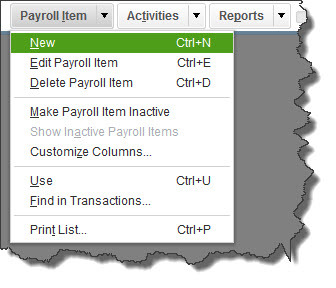 At the bottom of this list, you’ll see three drop-down menus: Payroll Item, Activities, and Reports. When you click on the down arrow next to Payroll Item you’ll see the menu displayed in the above image. Warning: There are many options in this menu for altering Payroll Item definitions. QuickBooks allows you to do this, but use caution here. If it involves an action that you are not familiar with, please call the office for assistance. Figure 3: You can add Payroll Items by working your way through this wizard-like progression of screens. QuickBooks will help you here by asking questions and building a Payroll Item based on your responses. There’s much more to know about working with Payroll Items and assigning them to employees. When you’re ready to start processing payroll in QuickBooks, don’t hesitate to call the office for help getting started! Individuals – If you have an automatic 6-month extension to file your income tax return for 2015, file Form 1040, 1040A, or 1040EZ and pay any tax, interest, and penalties due. Electing Large Partnerships – File a 2015 calendar year return (Form 1065-B). This due date applies only if you timely requested a 6-month extension of time to file the return. Employers – Social Security, Medicare, and withheld income tax. File form 941 for the third quarter of 2016. Deposit any undeposited tax. (If your tax liability is less than $2,500, you can pay it in full with a timely filed return.) If you deposited the tax for the quarter in full and on time, you have until November 10 to file the return.